Jersey Boys - What a Jol! You are here / South Africa Travel News / Entertainment / Jersey Boys – What a Jol! Now reading: Jersey Boys – What a Jol! 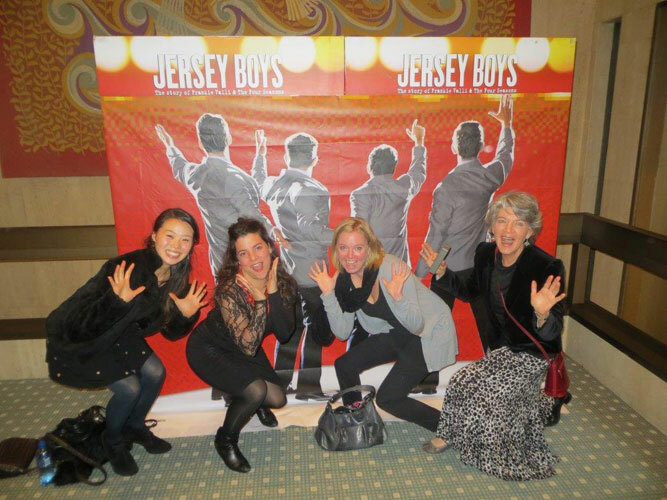 Jersey Boys – What a Jol! I am a self proclaimed musical nut. I love all things theatre, but musicals are my favourite. My dvd and music collection will affirm this should you have any doubt. When I heard that Jersey Boys was coming to Cape Town I was ready and gathered the troops and off we went. To be honest I hadn’t a clue what the show would be about – so let me give you a little bit of background. Jersey Boys tells the story of Frankie Vallie and the Four Seasons. Who you ask? Well you’ll know who I mean once you’re at the show because the music is one hit after another. This rags to riches tale unfolds as four guys from the dodgy part of town make it big. Writing and singing their own songs they make it big on the world music scene with songs like “Big Girls Don’t Cry”, “Oh, What a Night”, “Walk Like a Man” and plenty other numbers that will get your toes tapping and your heart pumping. Now with a bit of background lets talk about the South African cast and their performance. One word – incredible. Franki Valli played by Grant Almirall stole both the show and the hearts of the ladies. This is an extremely demanding role and his voice was crystal clear while he hit each note perfectly. You may know Almirall from previous productions including Cats and Jesus Christ Superstar. We all decided after the show that we could listen to his voice every day and his portrayal of Valli was wonderful. With it being such a vocally demanding role I am told that there is an alternate Valli, played by Jaco van Rensberg, part of me would like to go again when he is Valli. Tommy DeVito who is the main guy who gets this group going and discovers Valli is played by Daniel Buys (Mamma Mia and Boys in the Photographs). His character is one you love to hate, he’s makes mistakes that the group take the fall for but you find yourself warmed by his performance. Emanuel Castis, who you might remember from local soapie Isidingo, plays Nick Massi. His character really comes alive halfway through the show and he has a number of lines that will make your belly ache from laughing so much. His singing was superb and and all round consummate performance from Castis. Rounding up the group is Bob Gaudio who is the man behind the music, writing the hits that shot The Four Seasons to fame, played by Kenneth Meyer brings an unassuming but powerful character to this dynamic bunch. Once you put these four voices together there is magic I tell you – reminiscent of the original band, I’m sure they’d be proud to have these guys playing them on stage. The cast is male dominated but the three woman who take to the stage need to be mentioned. They have a number of roles throughout the show and the singing and characters were great, so hats off to Carmen Pretorius (High School Musical and Mamma Mia); Taryn-Lee Hudson (Let The Good Times Roll ) and Kirsten Murphy (Grease). This show will leave you with a song in your heart and a spring in your step. Bravo to the cast and crew (thanks to the awesome direction of Anton Luitingh) I thoroughly encourage you to go out today and get tickets before they are sold out. This is onc production you will be sad to have missed, young and old will enjoy this show and if we don’t support the arts we won’t have awesome productions like this to enjoy. So go on … get your tickets now. Jersey Boys is running at the Artscape Theatre until the 4th of August 2013, with two shows on a Saturday and Sunday. Tickets start from R100 per person up to R350 per person (every cent is worth it). Get your tickets from Computicket or call the Artscape box office +27 (0)21 410-9800 for more assistance. I must see – and I agree! I could have walked straight back into the theatre and seen it again. So glad I didn’t spend R600+ on a ticket when I was New York (haha sounds like bragging). Wonderful South African theatre to be proud of. I cant wait, I have my tickets booked! this is going to be amazing!!!!! Ahhh I wish this kind of thing would come to Durbs but no such luck. Sounds fab! I need to go! I will go! Go, go now! This was an amazing production. WOW!